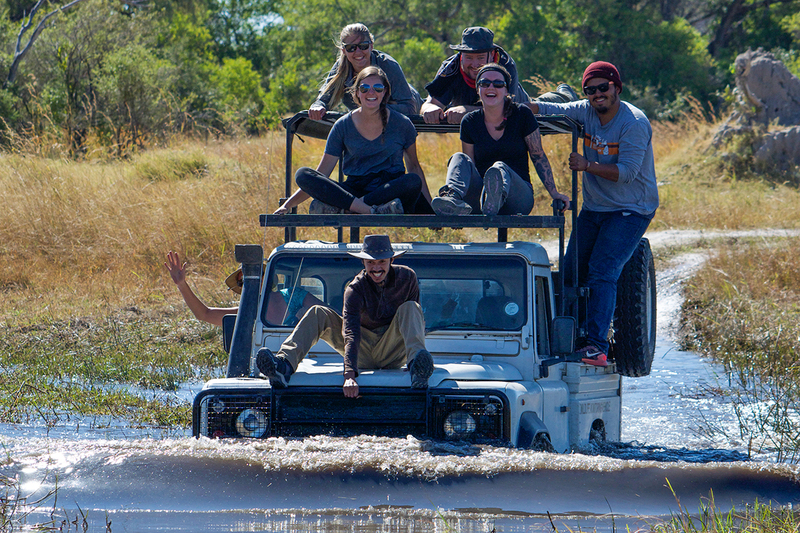 U. of I. animal sciences students spent nine weeks studying wildlife in Botswana's Okavango Delta and Chobe Enclave Region. OKAVANGO DELTA, BOTSWANA - It was 6 a.m. and the campers were quietly preparing for the day. Suddenly, a voice called out from the camp manager’s tent. 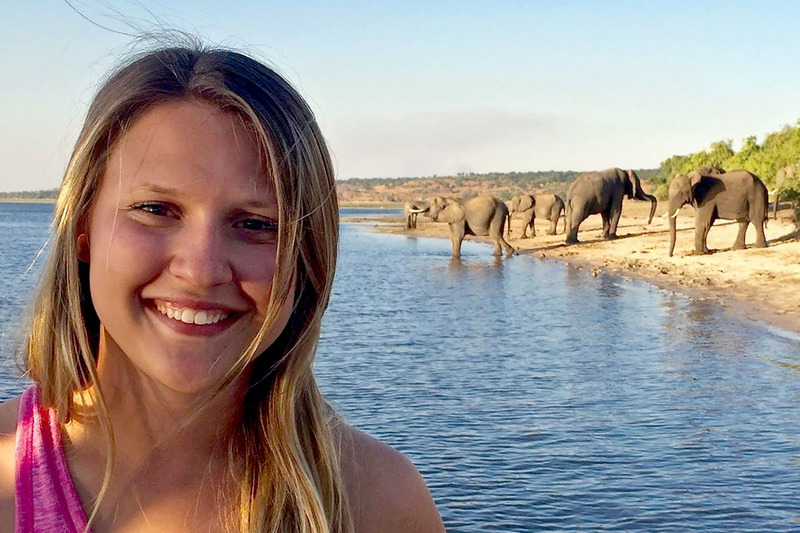 It was the start of another ordinary, extraordinary day in Botswana for animal sciences students Katie Campbell and Taylor Damery. 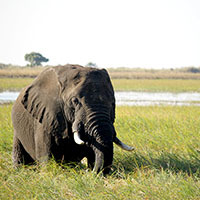 The pair were enrolled in a nine-week field course to study wildlife in Botswana’s Okavango Delta and Chobe Enclave Region. 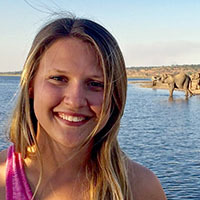 Jordana Meyer, an alumna of the College of Agricultural, Consumer and Environmental Sciences, oversees on-the-ground operations for the course in Botswana. 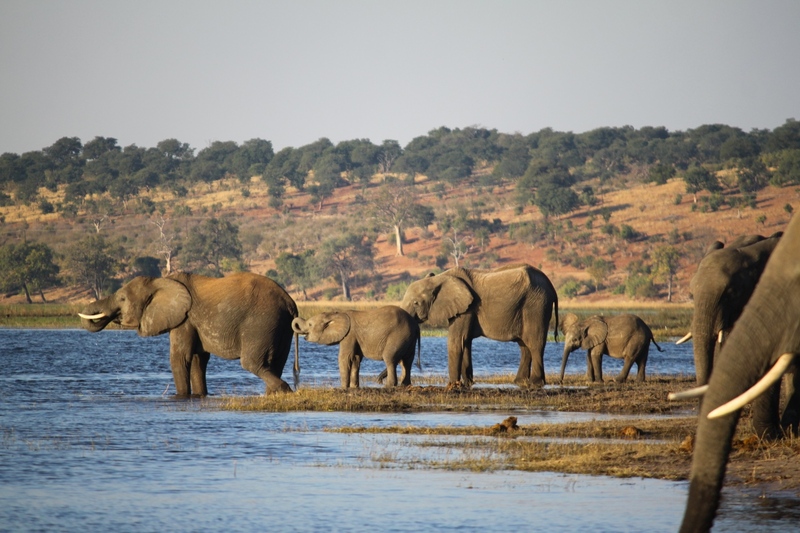 “Botswana has some of the greatest wildlife diversity in Africa,” Meyer said. 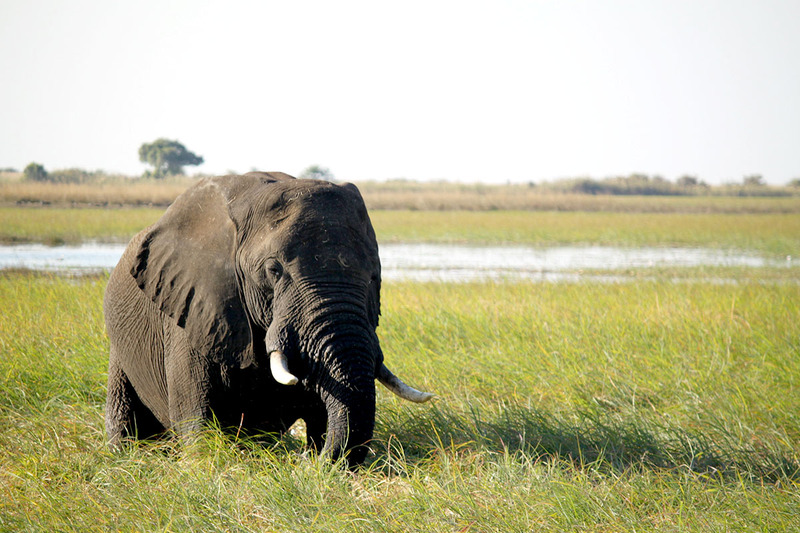 “The Okavango Delta is a UNESCO World Heritage site and is home to the densest population of elephants in the world, not to mention hundreds of other mammals, birds, reptiles, amphibians and fish. Taylor Damery at a popular watering hole for wildlife. Neither Damery, a 21-year-old senior from Blue Mound, Illinois, nor Campbell, a 20-year-old junior from Naperville, Illinois, needed much convincing. Both were already interested in study abroad opportunities, and after they attended Meyer’s information session at the U. of I., they applied right away. “I liked that it was so specific to animals, and that there was a conservation aspect to it. There was so much for me to learn. I wanted to go so badly,” Campbell said. Campbell and Damery were joined by 11 other students from the U. of I. and around the world. 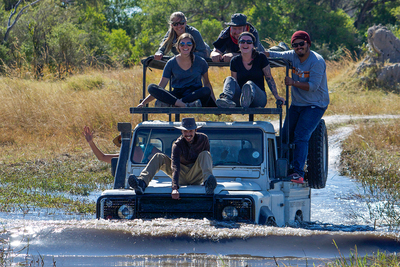 After landing in Botswana, the group spent a week training in Maun. Researchers from all over the world came to give lectures on animal biology, physiology and behavior, and on the environment in the region. As the week progressed, the group discovered that animals in the protected areas were forced to traverse through farmers’ properties to get to a major water source. Native herbivores were competing with cattle for forage and eating crops. Predators were killing livestock, and farmers were retaliating. Campbell and Damery were fascinated, so they signed up to conduct research on human-wildlife conflict, along with four other students. Students discovered that animals in protected areas had to pass through farmers' lands to get to a major water source. “We interviewed farmers to see what kind of conflict they were experiencing. Many were having such bad elephant problems that they quit growing crops altogether,” Damery said. Students paired off to focus on different aspects of the human-wildlife conflict, but everyone helped each other. Campbell and her partner studied herbivore population dynamics. Each day, they would tally the herbivores they observed along a transect. Later, they analyzed their results to determine if the herbivore populations were growing, shrinking or moving. Damery and her partner looked at how elephants moved across the landscape. They used a similar transect approach, going out early in the morning and looking for elephant footprints along pathways. “How often were they using the paths? What type of herds were using it? Was it a bachelor herd, a lone bull or a matriarchy? We were able to answer all those questions by analyzing footprints on the road. We got some good data back,” Damery said. Each group entered observations into a database started by past groups of students using the same methods. These repeated measurements not only allow for a long-term view of wildlife dynamics in the region, they also inform government policies that benefit both farmers and wildlife. What’s more, the research builds important skills for the students, many of whom had little hands-on research experience prior to the trip. Natural resources and environmental sciences professor and course coordinator Bob Schooley said the students learn general skills like designing experiments and collaborating with other researchers while gaining experience with standard wildlife biology research methods. “Fortunately, these skills are not restricted to Africa. This knowledge can really help students when they’re applying for jobs,” Schooley said. After their long days collecting data, the students had few creature comforts waiting back at camp. “I really loved camping, but I wasn’t prepared to be constantly dirty, to cook my own food and to have to heat up my shower bucket over the fire. We made the best of it,” Damery said. But living in the midst of these iconic creatures was the experience of a lifetime for animal lovers Campbell and Damery. Lions, hyenas and elephants made regular visits to the camp. The students' research may help reduce conflicts between wildlife and humans, who must share the landscape. The group of students grew close quickly – a good thing, since they were working and camping in close quarters for two months. For Campbell and Damery, life in the bush felt slower and richer. Both Damery and Campbell, who hope to go into veterinary medicine, have spent some time reevaluating their paths after coming back to the U. of I. Campbell is pursuing a research opportunity with comparative biosciences professor Prabhakara Reddi in the College of Veterinary Medicine that she hopes will give her more options going forward. Damery is still planning to be a veterinarian, but she’s holding off on her application for a year to get more practical experience. “If vet school doesn’t work out, I could see myself in a career doing wildlife research,” she said.